Ornithoptera Aesacus -Male -Obi Island, Indonesia -(5.25 in wingspan). Endemic to Obi Island and Extremely Rare. This Birdwing has a beautiful Turquoise Blue Sheen. It is extremely hard to find in the wild due to extensive logging on the island. It remains threatened, but is commercially bred. 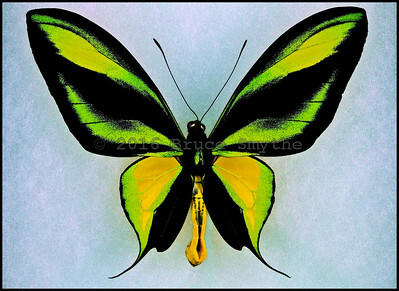 Twenty years ago it was the Rarest Birdwing species in the world. Ornithoptera Chimaera Chimaera -Male -Oiwa Village, Morobe Province, Papua New Guinea -(5.5 in wingspan). This is Rare. 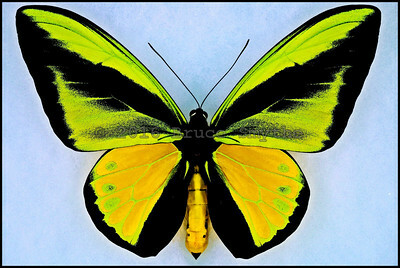 Ornithoptera Croesus Croesus(Wallace's Golden Birdwing) -Male -Bacan Island, Indonesia -(5.5 in wingspan). Named after the British Naturalist Alfred Russel Wallace, who discovered the species in 1859. This subspecies(Croesus) has a lighter golden orange color than the subspecies Lydius and Toeantei. Furthermore, this subspecies has a green sheen when viewed from an angle. 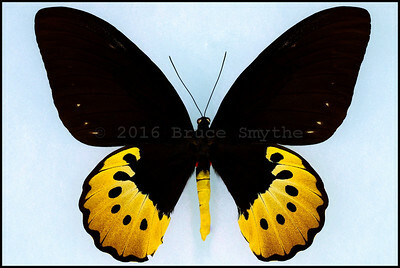 Ornithoptera Croesus Lydius, form Boutani -Male -Halmahera Island, Indonesia -(5.75 in wingspan). 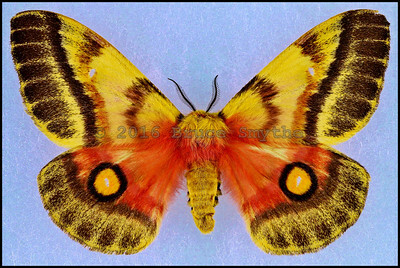 Form Boutani is the yellow patch(aberration) on the forewings. 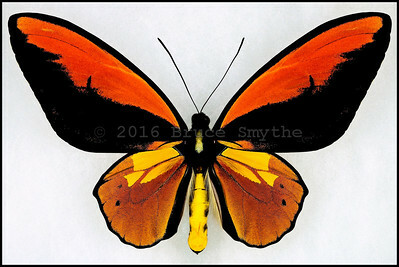 Ornithoptera Croesus Lydius -Female -Verso -Halmahera Island, Indonesia -(7 in wingspan). In my opinion, the Verso Side of this butterfly is much nicer than the Recto Side. Ornithoptera Croesus Toeantei -Male -Morotai Island, Indonesia -(5.5 in wingspan). This subspecies(Toeantei) usually has a darker and deeper orange color than the subspecies Lydius. 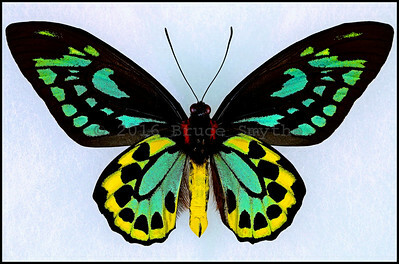 Ornithoptera Euphorion(7 Gold Spots) -Male -Recto -Australia -(4.25 in wingspan). Endemic to North-Eastern Australia and the Common Name is Cairns Birdwing. 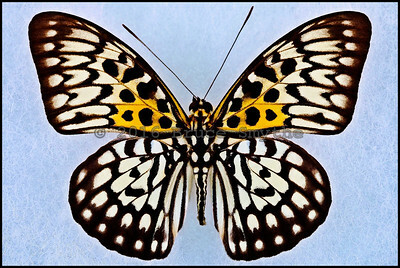 This specimen has 7 gold spots which is Very Rare. 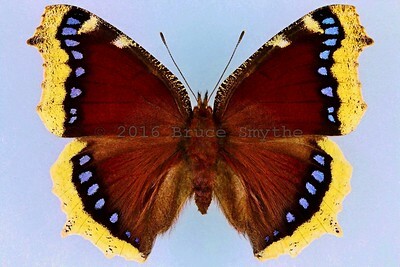 Ornithoptera Euphorion(7 Gold Spots) -Male -Verso -Australia -(4.25 in wingspan). Endemic to North-Eastern Australia and the Common Name is Cairns Birdwing. This specimen has 7 gold spots which is Very Rare. 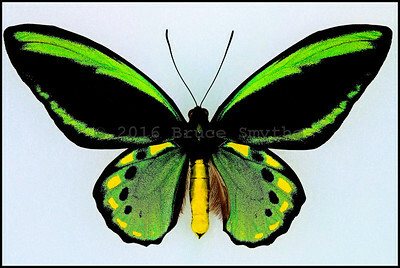 Ornithoptera Euphorion(Bright Golden Green) -Male -Recto -Australia -(5 in wingspan). Endemic to North-Eastern Australia and the Common Name is Cairns Birdwing. This specimen has a Bright Golden Green color. Ornithoptera Goliath Procus -Female -Seram, Indonesia -(8 in wingspan). Ornithoptera Goliath is the second largest butterfly in the world, after Queen Alexandra's Birdwing. 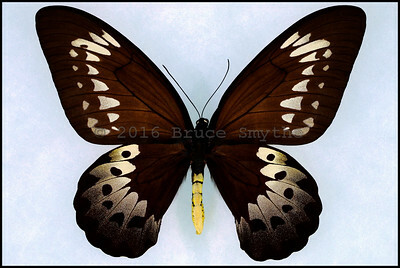 Note, that in the 5 subspecies of Female Ornithoptera Goliath only this one(Procus) has all WHITE at the bottom of the hindwings. 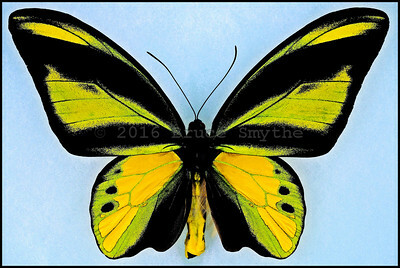 The Female Ornithoptera Goliath for subspecies Supremus, Samson and Atlas all have a GOLDEN YELLOW at the bottom of the hindwings. 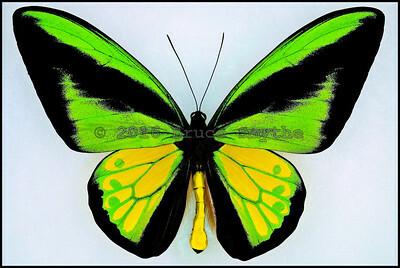 The Female Ornithoptera Goliath for subspecies Ukihidei has YELLOW at the bottom of the hindwings. Ornithoptera Goliath Procus -Male -Seram, Indonesia -(6.5 in wingspan). 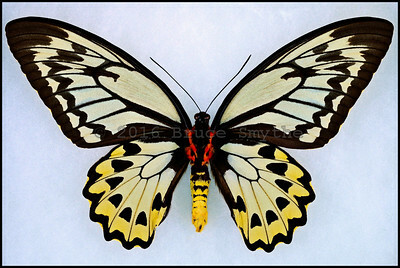 Ornithoptera Goliath is the second largest butterfly in the world, after Queen Alexandra's Birdwing. There are 5 subspecies of Ornithoptera Goliath, But, in my opinion, Procus is by far the best ssp. in that the Male has the darkest green and it has the largest veins in the hindwings. 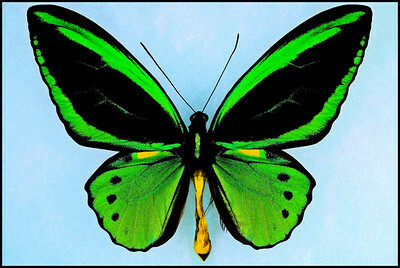 Ornithoptera Goliath Supremus form Titan -Female -Morobe Province, Papua New Guinea -(7.75 in wingspan). 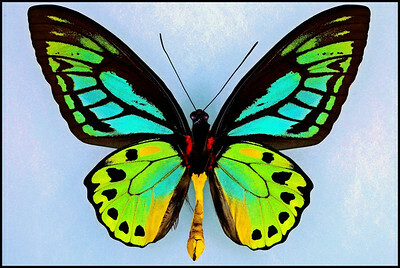 Ornithoptera Goliath is the second largest butterfly in the world, after Queen Alexandra's Birdwing. 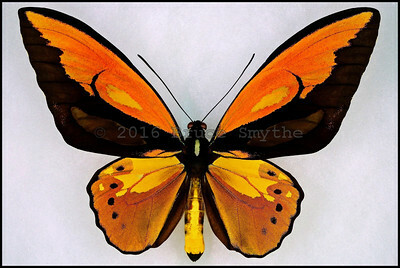 Note, that in the 5 subspecies of Female Ornithoptera Goliath this subspecies(Supremus) along with subspecies Samson and Atlas all have a GOLDEN YELLOW at the bottom of the hindwings. 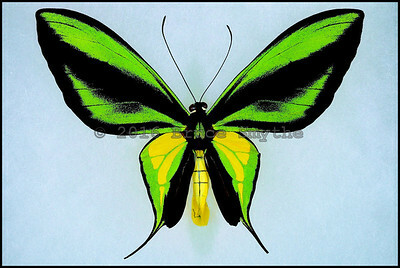 The Female Ornithoptera Goliath for subspecies Ukihidei has YELLOW at the bottom of the hindwings. 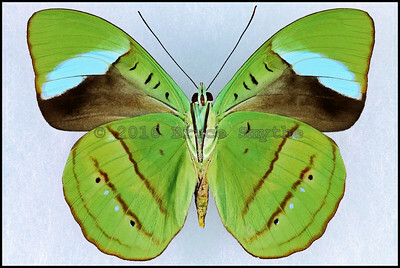 The Female Ornithoptera Goliath for subspecies Procus has WHITE at the bottom of the hindwings. Ornithoptera Goliath Ukihidei -Female -Yapen Island, Papua, Indonesia -(7.25 in wingspan). Ornithoptera Goliath is the second largest butterfly in the world, after Queen Alexandra's Birdwing. Note, that in the 5 subspecies of Female Ornithoptera Goliath only this one(Ukihidei) has YELLOW at the bottom of the hindwings. 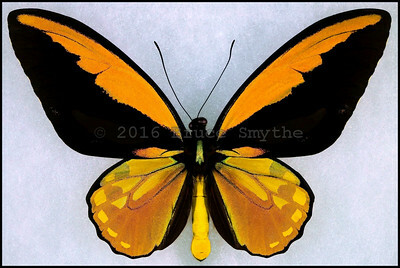 The Female Ornithoptera Goliath for subspecies Supremus, Samson and Atlas all have a GOLDEN YELLOW at the bottom of the hindwings. 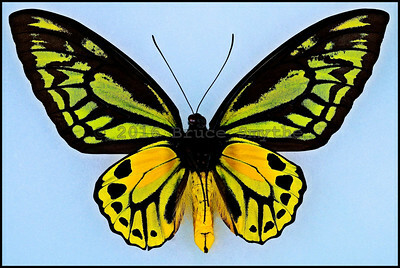 The Female Ornithoptera Goliath for subspecies Procus has WHITE at the bottom of the hindwings. Ornithoptera Goliath Ukihidei -Male -Yapen Island, Papua, Indonesia -(6 in wingspan). 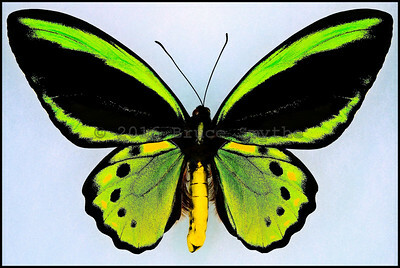 Ornithoptera Goliath is the second largest butterfly in the world, after Queen Alexandra's Birdwing. 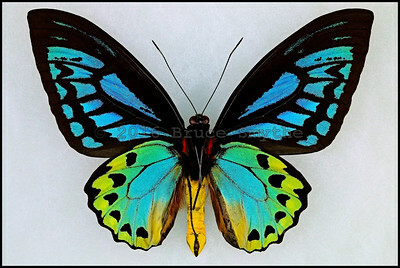 This has very BRIGHT iridescent colors and it is almost identical to all of the other Ornithoptera Goliath Male subspecies EXCEPT for the Ornithoptera Goliath Procus which has a much darker green and it has much larger veins in the hindwings. 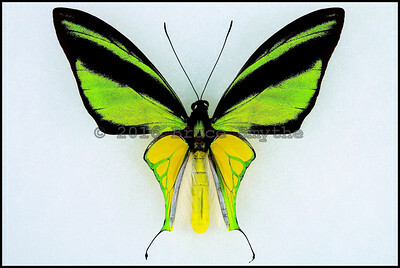 Ornithoptera Meridionalis Tarunggarensis -Male -West Papua, Indonesia -(4 in wingspan). 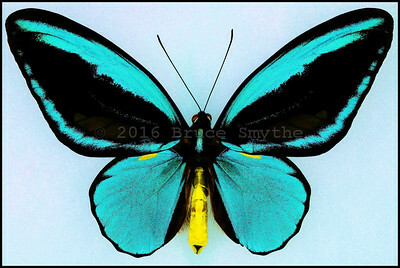 This is the smallest species in Ornithoptera and it is Extremely Rare. The Common Name is 'Southern Tailed Birdwing'. 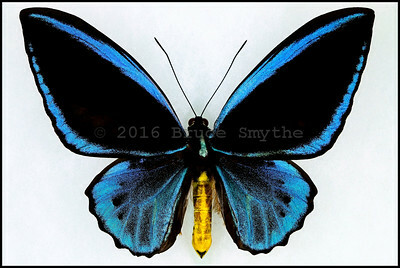 Ornithoptera Paradisea Arfakensis -Male -Arfak Mtns, West Papua, Indonesia -(4.75 in wingspan). This subspecies of Paradisea is known for having yellow infused with the green at the top of the forewings. 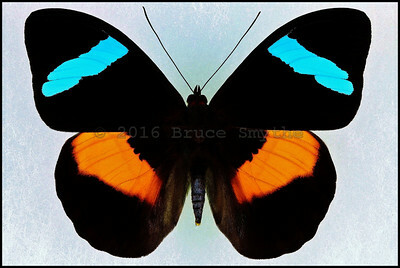 Ornithoptera Paradisea Chrysanthemum -Male -Arfak Mnts, West Papua, Indonesia -(4.5 in wingspan). This has the darkest green in all of the subspecies of Paradisea. 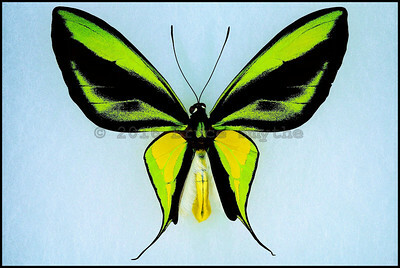 Ornithoptera Paradisea Detanii -Male -Timika, Papua, Indonesia -(4 in wingspan). This has the brightest green in all of the subspecies of Paradisea. Ornithoptera Priamus Caelestis -Male -Recto -Misima Island, Milne Bay Province, Papua New Guinea -(4.5 in wingspan). Similar to Ornithoptera Priamus Urvillianus, but about half the size. I think the colors on both the Recto and Verso of Caelestis are usually more beautiful than on the Urvillianus. Ornithoptera Priamus Caelestis -Male -Verso -Misima Island, Milne Bay Province, Papua New Guinea -(4.5 in wingspan). Similar to Ornithoptera Priamus Urvillianus, but about half the size. I think the colors on both the Recto and Verso of Caelestis are usually more beautiful than on the Urvillianus. Ornithoptera Priamus Hecuba -Male -Recto -Kai Islands, Indonesia -(5.25 in wingspan). Ornithoptera Priamus Hecuba -Male -Verso -Kai Islands, Indonesia -(5.25 in wingspan). 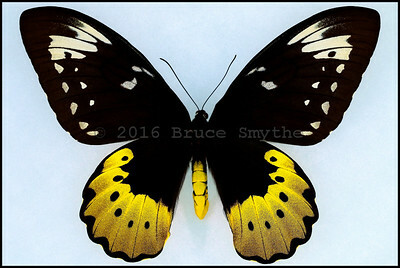 Ornithoptera Croesus Croesus(Wallace's Golden Birdwing) -Male -Bacan Island, Indonesia -(5.5 in wingspan). green sheen when viewed from an angle.